In praise of the Golf Channel and its amazing embrace of golf minutiae. Morning shows about golf. Talk shows about golf. Reality shows about golf. The Golf Channel has it figured out. Hosts on the set of Morning Drive. This week, the Golf Channel will broadcast 70 hours of television from the Masters tournament in Augusta, Ga. There’ll be news conferences, feature stories, highlight packages, shot analysis. Everything but live play. The Golf Channel doesn’t have the rights to televise this or any of the men’s majors, but that won’t stop it from covering the tournament from dawn to dusk. I’ve never played a round of golf that didn’t involve tiny windmills, and the only time I look at golf coverage on the sports pages is to admire the argyles and plus fours. Yet after a week of watching the Golf Channel, I’m a convert—not to the sport, but to the channel’s celebration of full-on, no-holds-barred, nothing-too-nerdy, knowledge-dropping expertise, packaged in familiar, cozy TV formats. Tune in at any time of day or night, and you’re likely to find a program you recognize: morning show, talk show, news magazine, reality contest, late-night chat fest. They’re just all about golf. 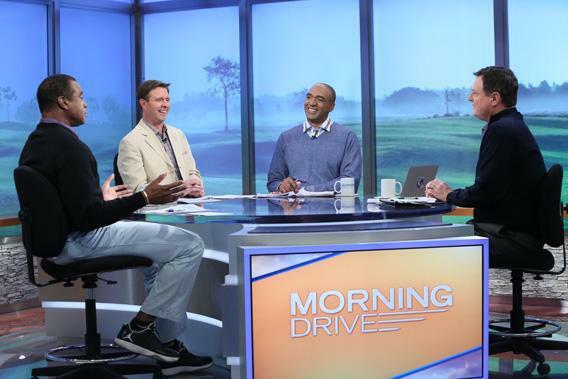 Whether the discussions happen around the anchor desk or in the comfy chairs of the conversation pit, Morning Drive segments are long and nerdy. Spending several days with the Golf Channel reminded me of an immersion language course—with no translation of stats like GIR or of obscure PGA policies on player pairings, there were times when I felt utterly lost, but I still felt invested in passionate debates about putting techniques. The only time Morning Drive abandons the world of golf is when the host throws to a CNBC anchor for a brief market report. It’s as though the channel is telling its viewers, “We know you’re all titans of industry,” but the update is so superficial—a quick check on the Dow and the NASDAQ and a preview of the day ahead—that it couldn’t possibly serve any purpose other than flattery. Still, the audience is decidedly upscale: The Golf Channel, which broke its own ratings records in 2012, attracts an audience that skews old and male, and the network’s tight targeting clearly appeals to advertisers. Even in the middle of the day or the early hours of the morning, the commercials are the classy kind every network dreams of, pushing cars, banks, hotels, resorts, and all manner of golf gear. Although the Golf Channel doesn’t have the Masters, it televises more live golf than all other U.S. networks combined, men’s and and women’s tournaments from all over the world. Fortunately for the channel, golf is a sport that for all intents and purposes has no offseason. Less conveniently, tournaments run Thursday through Sunday, which leaves a three-day gap in the TV schedule. That’s where the instructors, talkers, and wannabes come in. Early in the week, tournament play gives way to Feherty, an interview show hosted by TV analyst David Feherty (he reckons himself a comedian, but trust me, he’s just “golf funny”); The Haney Project: Michael Phelps, in which a “legendary swing coach” tries to help the swimmer improve his golf game (in previous seasons Hank Haney has worked with Rush Limbaugh, Charles Barkley, and Ray Romano); and In Play With Jimmy Roberts, in which the guy who used to gum up NBC’s Olympics coverage with sappy sob stories does the same thing to the Golf Channel. These programs are the rare cases when the channel’s long leash feels like a problem: An hourlong show requires Feherty to mug for the camera between interview segments in a naked attempt to eat up minutes, and Phelps is a bore who spends most of the hour making excuses for his failure to practice. More successful is Big Break, a reality competition that will enter its 19th cycle in May. The format of immunity challenges and elimination will be familiar to anyone who’s watched Project Runway or Top Chef. In this case, the contestants are fighting for the chance to play in a pro tournament, and astonishingly, several Big Break alumnae are now regulars on the PGA and LPGA tours, including Tommy “Two Gloves” Gainey, who won a PGA Tour event in 2012. Of course, there are other single-sport networks, but the Golf Channel is part of my basic cable package, while the Tennis Channel and the NFL, NHL, NBA, and MLB networks are premium options that only the already obsessed would shell out for. And it’s the Golf Channel’s mind-blowing commitment to minutiae that turns me green with envy. Round-the-clock news channels are all over the dial, but because they’re gunning for a general audience, they stick to the superficial. Those of us interested in international affairs, public policy, or television have to settle for point-counterpoint arguments and slick two-minute feature stories, while what we really want is the hard-news equivalent of the Golf Channel’s in-depth, technical discussions. It’s so unfair, I’m tempted to organize a protest—just as soon as the Masters is over. It’s just that Padraig Harrington has been tinkering with his swing again, Rory McIlroy seems to be adjusting to his new clubs, and did you see Jim Furyk’s final shot at the Valero Texas Open?